According to the pact, Italy was to leave the Triple Alliance and join Triple Entente, as already stated in a secret agreement signed in London, on 4-5 September 1914. 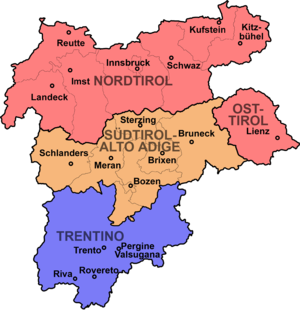 Furthermore, Italy was to declare war against Germany and Austria-Hungary within a month (this would happen against Austria-Hungary within a month but much later, 1916, with Germany ), Italy was to obtain the following territorial gains (see Italia irredenta) at the end of the war. The Italians insisted, and the Allies agreed, that the question of the Adriatic coast between Zara and Istria should be settled after the war. They also insisted that Serbia should not be informed about the agreements. This, however, the Allies overruled by sending to the Government of Serbia an official note, dated 4 August 1915, confirming the postwar territorial claims of Serbia and Montenegro. Picture - Lands offered to Serbia by the Allies in 1915. At the Paris Peace Conference, the Italians insisted that they would negotiate only with their wartime allies Serbia and Montenegro, not with defeated enemies included in delegation of the new Kingdom of Serbs, Croats and Slovenes. In particular they were incensed that three members of the delegation were former Austro-Hungarian deputies (Croats Ante Trumbić, Josip Smodlaka, and the Slovene Otokar Rybx�ř), and that one (the Slovene Ivan Žolger) had served as Minister in the wartime Austrian Cabinet. The pact was nullified with the Treaty of Versailles, because President Woodrow Wilson, supporting Slavic claims and not recognizing the treaty, rejected Italian requests on Dalmatian territories. Italy was also denied the treaty's previous agreement of expanding the Italian colonial empire with Germany's Asian and African colonies and make claims on Albania.